Offers available- Visit us today for details! Nav System, iPod/MP3 Input, Bluetooth, Back-Up Camera. Granito Gray exterior, Pop trim. EPA 33 MPG Hwy/28 MPG City! READ MORE! OPTION PACKAGES BEATS PREMIUM AUDIO SYSTEM, NAVIGATION & SATELLITE PACKAGE GPS Navigation, For More Info, Call 800-643-2112, 1-Yr SiriusXM Radio Service, SiriusXM Satellite Radio, URBANA CABRIO APPEARANCE PACKAGE Instrument Panel Black Bezel, Side Sills Ground Effects, Silver Accent Stitching, Wheels: 16 x 6.5 Hyper-Black Aluminum, Black Trimmed Lights, POPULAR EQUIPMENT PACKAGE ATC Air Conditioning w/Micron Filter, Rear View Auto Dim Mirror w/Microphone, TRANSMISSION: 5-SPEED C510 MANUAL (STD). EXPERTS REPORT Style is where the 2018 Fiat 500 shines, and it looks like no other car on the road. -TheCarConnection.com. Fuel economy calculations based on original manufacturer data for trim engine configuration. Pop trim. FUEL EFFICIENT 33 MPG Hwy/28 MPG City! Bluetooth, Aluminum Wheels, Turbo Charged Engine, Back-Up Camera, iPod/MP3 Input AND MORE! WHY BUY FROM US Indy's largest selection of Buicks, GMC Trucks, Kias and Mitsubishis. Ray Skillman Auto Center in Indianapolis, IN, also serving Greenwood, IN and Plainfield, IN is proud to be an automotive leader in our area. Since opening our doors, Ray Skillman Auto Center has kept a firm commitment to our customers. We offer a wide selection of vehicles and hope to make the car buying process as quick and hassle free as possible. Conveniently located just 1/2 mile north of Greenwood Park Mall on US 31 S. EXPERTS RAVE TheCarConnection.com's review says Style is where the 2018 Fiat 500 shines, and it looks like no other car on the road.. Fuel economy calculations based on original manufacturer data for trim engine configuration. Pop trim. Bluetooth, Aluminum Wheels, Turbo Charged, Back-Up Camera, iPod/MP3 Input. EPA 33 MPG Hwy/28 MPG City! SEE MORE! EXPERTS REPORT Style is where the 2018 Fiat 500 shines, and it looks like no other car on the road. -TheCarConnection.com. Fuel economy calculations based on original manufacturer data for trim engine configuration. Navigation, Sunroof, Back-Up Camera, iPod/MP3 Input. Metallo Gray exterior, Pop trim. FUEL EFFICIENT 33 MPG Hwy/28 MPG City! CLICK ME! OPTION PACKAGES TRANSMISSION: 6-SPEED AISIN F21-250 HD AUTOMATIC 3.502 Final Drive Ratio, POWER SUNROOF, BEATS PREMIUM AUDIO SYSTEM, NAVIGATION & SATELLITE PACKAGE GPS Navigation, For More Info, Call 800-643-2112, 1-Yr SiriusXM Radio Service, SiriusXM Satellite Radio, POPULAR EQUIPMENT PACKAGE ATC Air Conditioning w/Micron Filter, Rear View Auto Dim Mirror w/Microphone. EXPERTS REPORT Style is where the 2018 Fiat 500 shines, and it looks like no other car on the road. -TheCarConnection.com. Fuel economy calculations based on original manufacturer data for trim engine configuration. Bianco (White) exterior and Dark Slate Gray interior, Pop trim. FUEL EFFICIENT 30 MPG Hwy/22 MPG City! Smart Device Integration SEE MORE! OPTION PACKAGES POPULAR EQUIPMENT GROUP Air Conditioning ATC w/Dual Zone Control, Power 2-Way Driver Lumbar Adjust, ParkSense Rear Park Assist System, Rear View Auto Dim Mirror w/Compass, SiriusXM Satellite Radio, For More Info, Call 800-643-2112, 1-Year SiriusXM Radio Service. Fuel economy calculations based on original manufacturer data for trim engine configuration. Pop trim. Smart Device Integration, Bluetooth, QUICK ORDER PACKAGE 23D, Alloy Wheels, Turbo Charged. EPA 30 MPG Hwy/22 MPG City! READ MORE! OPTION PACKAGES Fuel economy calculations based on original manufacturer data for trim engine configuration. EPA 30 MPG Hwy/22 MPG City! Pop trim, Blu Denim exterior and Warm Gray interior. Smart Device Integration, Bluetooth, Aluminum Wheels CLICK NOW! WHY BUY FROM US Indy's largest selection of Buicks, GMC Trucks, Kias and Mitsubishis. Ray Skillman Auto Center in Indianapolis, IN, also serving Greenwood, IN and Plainfield, IN is proud to be an automotive leader in our area. Since opening our doors, Ray Skillman Auto Center has kept a firm commitment to our customers. We offer a wide selection of vehicles and hope to make the car buying process as quick and hassle free as possible. Conveniently located just 1/2 mile north of Greenwood Park Mall on US 31 S. OPTION PACKAGES POPULAR EQUIPMENT GROUP Air Conditioning ATC w/Dual Zone Control, Power 2-Way Driver Lumbar Adjust, ParkSense Rear Park Assist System, Rear View Auto Dim Mirror w/Compass, SiriusXM Satellite Radio, For More Info, Call 800-643-2112, 1-Year SiriusXM Radio Service. Fuel economy calculations based on original manufacturer data for trim engine configuration. Pop trim. FUEL EFFICIENT 30 MPG Hwy/22 MPG City! Smart Device Integration, Bluetooth, QUICK ORDER PACKAGE 23D, Aluminum Wheels CLICK NOW! OPTION PACKAGES Fuel economy calculations based on original manufacturer data for trim engine configuration. Smart Device Integration. Pop trim, Grigio Scuro (Gray Metallic) exterior and Dark Slate Gray interior. EPA 30 MPG Hwy/22 MPG City! SEE MORE! WHY BUY FROM US Indy's largest selection of Buicks, GMC Trucks, Kias and Mitsubishis. Ray Skillman Auto Center in Indianapolis, IN, also serving Greenwood, IN and Plainfield, IN is proud to be an automotive leader in our area. Since opening our doors, Ray Skillman Auto Center has kept a firm commitment to our customers. We offer a wide selection of vehicles and hope to make the car buying process as quick and hassle free as possible. Conveniently located just 1/2 mile north of Greenwood Park Mall on US 31 S. OPTION PACKAGES POPULAR EQUIPMENT GROUP Air Conditioning ATC w/Dual Zone Control, Power 2-Way Driver Lumbar Adjust, ParkSense Rear Park Assist System, Rear View Auto Dim Mirror w/Compass, SiriusXM Satellite Radio, For More Info, Call 800-643-2112, 1-Year SiriusXM Radio Service, CHROME APPEARANCE GROUP Bright Chrome Exterior Accents, Tires: 225/45R17 All Season, Wheels: 17 Machined Aluminum w/Black Pockets. Fuel economy calculations based on original manufacturer data for trim engine configuration. Navigation, Smart Device Integration, Bluetooth. Blue Tornado exterior and Warm Gray interior, Pop trim. EPA 30 MPG Hwy/22 MPG City! READ MORE! WHY BUY FROM US Indy's largest selection of Buicks, GMC Trucks, Kias and Mitsubishis. Ray Skillman Auto Center in Indianapolis, IN, also serving Greenwood, IN and Plainfield, IN is proud to be an automotive leader in our area. Since opening our doors, Ray Skillman Auto Center has kept a firm commitment to our customers. We offer a wide selection of vehicles and hope to make the car buying process as quick and hassle free as possible. Conveniently located just 1/2 mile north of Greenwood Park Mall on US 31 S. OPTION PACKAGES PREMIUM GROUP Radio: Uconnect 4 Nav w/7 Display, GPS Navigation, Air Conditioning ATC w/Dual Zone Control, Beats Premium Audio System, Power 2-Way Driver Lumbar Adjust, ParkSense Rear Park Assist System, Rear View Auto Dim Mirror w/Compass, SiriusXM Satellite Radio, For More Info, Call 800-643-2112, 1-Year SiriusXM Radio Service. Fuel economy calculations based on original manufacturer data for trim engine configuration. Nav System. FUEL EFFICIENT 30 MPG Hwy/22 MPG City! Grigio Chiaro (Graphite Metallic) exterior and Dark Slate Gray interior, Pop trim READ MORE! OPTION PACKAGES PREMIUM GROUP Radio: Uconnect 4 Nav w/7 Display, GPS Navigation, Air Conditioning ATC w/Dual Zone Control, Beats Premium Audio System, Power 2-Way Driver Lumbar Adjust, ParkSense Rear Park Assist System, Rear View Auto Dim Mirror w/Compass, SiriusXM Satellite Radio, For More Info, Call 800-643-2112, 1-Year SiriusXM Radio Service. Fuel economy calculations based on original manufacturer data for trim engine configuration. They say good things come in small packages. When it comes to the FIAT 500, truer words have never been spoken. 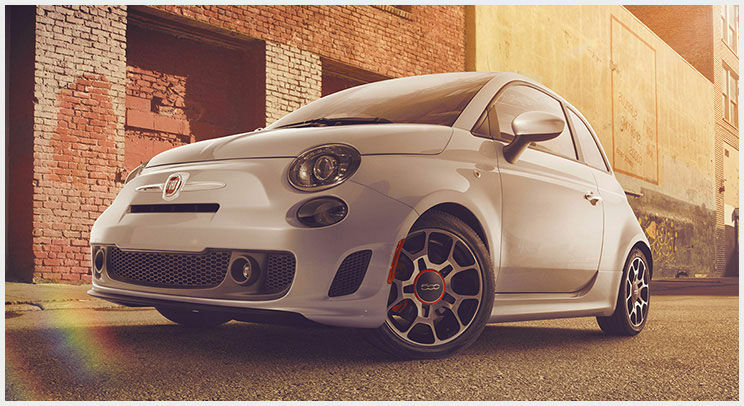 The FIAT 500 definitely manages to cram a whole lot of style and a ton of fun into a very tiny package. The FIAT 500 has earned more than 80 international awards, including the Consumer Digest Best Buy – Subcompact Cars?for 2015, 2014, 2013 and 2012 models. That’s quite a big accomplishment for such a small vehicle. Given its size, it’s undoubtedly the best pound-for-pound value around. Consumers looking for the ultimate in compact efficiency and style often look to FIAT, one of the earliest and grandest names in the automobile industry. Dating all the way back to 1899, FIAT was reintroduced to North America in 2011; since then it has amassed an intensely devoted audience seeking discovery through individualism. FIAT fans feel encouraged to live assertively and celebrate the small things with bounding excitement – everything that the FIAT 500 embodies. It’s no surprise that FIAT owners tend to be a bit more discerning and particular in their tastes. As such, the quality, value and unique style of FIAT are nearly as important as the service and satisfaction of a unique buying experience. At Ray Skillman New Whiteland FIAT, our commitment to customer satisfaction is second-to-none. We have developed our reputation as the premier FIAT dealer in central Indiana through an unwavering dedication to customer service. We understand your individual sense of value and style, that’s why we’re proud to offer a fantastic selection of you favorite FIAT models. FIAT drivers throughout Indiana trust NEW Whiteland FIAT for all their automotive needs—visit us today to learn more about what we can do for you!